A Winter Haven woman was robbed in broad daylight while at a park with her toddler. On 1-25-18 at approximately 10 a.m., the victim was at Kiwanis Park, located at 301 Ave C NE in Winter Haven. She and her toddler were in the fenced area of the park. There was nobody else at the park during the time. The victim saw a black male wearing a black hooded sweater and dark pants come into the park from the west. She saw a second black male approach from the east. The second male was wearing a dark hooded sweatshirt and gym shorts. The two entered into the fenced area where the victim and her child were located. She felt uneasy, so she picked up her child and started heading towards her car. As she was approaching her car, both subjects walked behind her and one said, “Give me your money or I’ll shoot!” She felt something in the middle of her back and the subject wearing the gym shorts punched her on the right side of her face. The punch caused her to fall to the ground holding her child. The child was not injured. While she was on the ground, the subject that punched her grabbed her purse from around her neck and both men ran east. The victim immediately ran to a business located directly across the street from the park. During a canvass of the area, Detectives located a man who was working on a nearby house who stated he saw two black men wearing clothes that matched the description given by the victim. 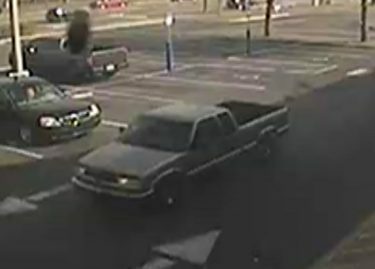 The two were seen getting out of an older model gold pickup truck, possibly a Chevrolet S10 with an extended cab and head towards the park. Both are described as black males, between 18 – 25 years old and approximately 6’ – 6’4” tall. The victim’s bank card was utilized approximately 45 minutes after the attack at a Redbox located at CVS (99 Magnolia Ave.) in Auburndale. A short time later, the card was used at Ace Wireless (413 Magnolia Ave.) in Auburndale to purchase 2 cellphones. Video surveillance of the truck was obtained at the CVS and the suspect who punched the victim is seen inside of the Ace Wireless store. Anyone who can identify the suspect is asked to call Heartland Crime Stoppers at 1-800-226-TIPS (8477). Callers are guaranteed anonymity and could be eligible for a CASH reward.